The latest C-MORE RTS2 red dot reflex sight series. It is the smallest reflex sight. Like other C-More competition sights, the all new RTS2 head up display provides an unobstructed sight picture in which the red dot hovers on the sight line, illuminating the point of impact on the target, allows you the fastest target acquisition possible, without straining your eyes. It also uses a beam-splitter lens made of hard coated glass for maximum scratch resistance and light transmission. The parallax free design enables targets to be acquired without the need to center the dot in the lens. The RTS2 uses a CR2032 lithium battery, which can be replaced without dismounting the sight. This eliminates the trouble of re-zeroing after replacing the battery. And the battery compartment is O-ring sealed for waterproofing. A 10 position manually operated push button switch provides precision intensity adjustment, previous intensity return, and auto off after 8 hours of inactivity. 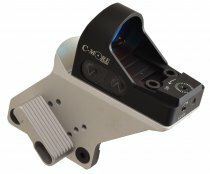 The C-MORE RTS2 series reflex sight is made of aviation alloy housing. And the electronics within are designed to handle the hottest loads from large caliber firearms. The RTS2 provides 1 moa click adjustment for windage and elevation resulting in supreme accuracy. A positive locking screw for both windage and elevation lock the adjustment screws in position. Note: The RTS2 can be attached to a Picatinny or Weaver Rail out of the box, or with the Rail Mount removed to mount the sight directly. Very good product. Fast delivery. Easy mounting on Ruger GP100 after installing a Weigand mount RASWMB Weig a Tinny. Very easy adjustment of hight and left-right. 6MOA makes hitting the targets easy on 10m, 25m and 50m . To change battery, just open the slide, the RTS2 stays on the Weigand mount, so no recalibrating necessary. Intensity is easy to adjust by the 2 knobs on the side. Protection cover is a very good solution to protect the lens. It is not the cheapest one, but far most the best one. Have also 2 serendipity red dots on my pistols. Also very happy with them. Hope however that the aluminium housing is stronger than the plastic ones of the serendipity wich starts to show a crack next to the little adjustment screw.